Grandparents of the world are you tired of homemade gifts yet? 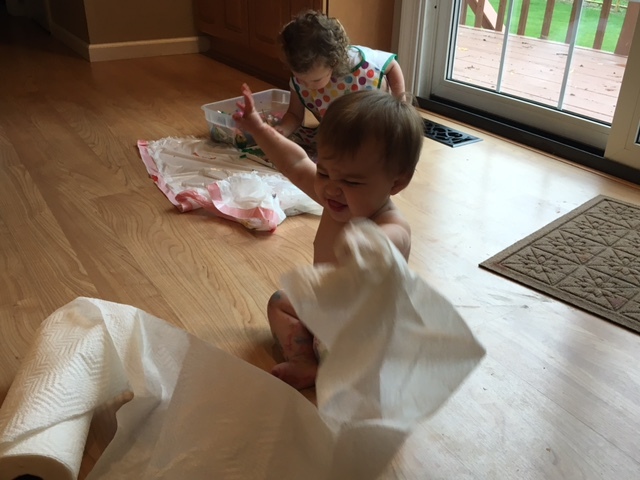 Well, sorry, here comes another tape pull painting craft fun for babies and toddlers alike! 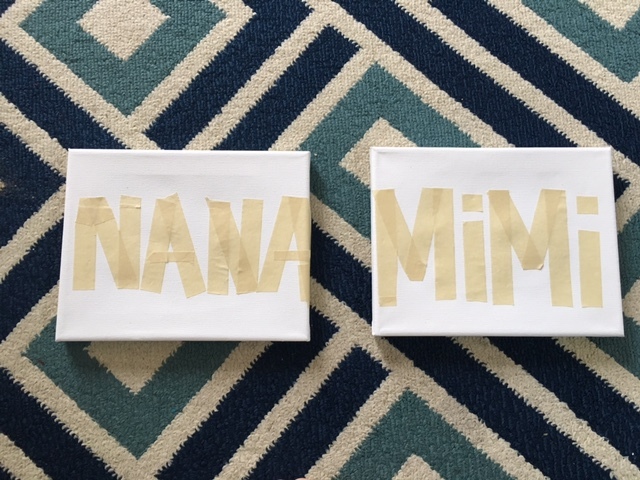 Mother’s Day is approaching quickly, and since the girls have been born we also acknowledge their MiMi and Nana on this day as well. As wonderful as a “real gift” is, the idea of giving is lost on kids this young. On birthday’s or holidays I like to encourage the girls to participate in making a gift for their family members so that they (well just Layla currently) can begin to understand that it’s important to take time to show appreciation for the people we love! Do I expect our family members to display these masterpieces forever? No (It’s okay guys, go ahead and toss that Valentines Day card from 2013). I do think its important for kids to see that gift giving isn’t always about spending money and pull painting is simple and cost effective. Our name paintings were so fun to make, and turned out great! This is a great project for siblings because it can span a huge range of ages. Already have your Mother’s Day gifts? 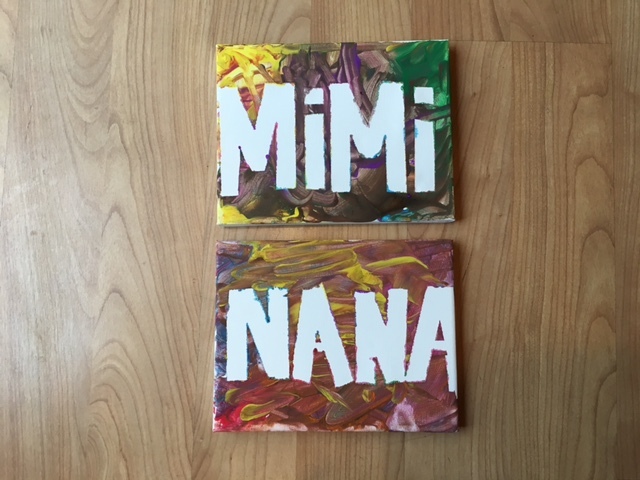 Try this project in a different way- Larger canvas could be substituted in with your child’s name to make a decoration for their room. You could even use wall decals to create an image (I’m thinking of trying this with a train for Layla’s room- updates to come). Begin by setting your canvas up for painting. Use your masking tape to create the letters of the name you want to spell. I used this as an opportunity to practice some letter recognition with Layla. She used our letter magnets to spell out the names before we taped. 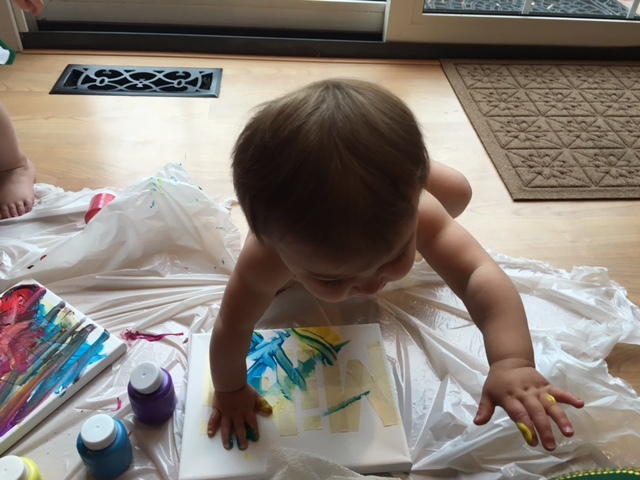 Place blobs of paint all over the canvas and let the kids go at it with their hands! You could also use sponges or paintbrushes. 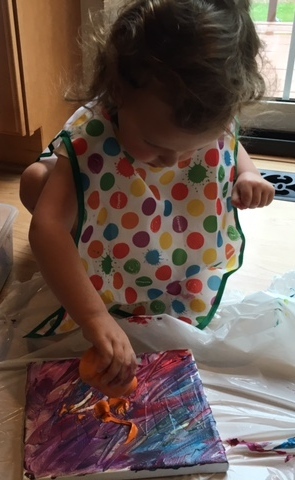 Olivia painted for about 3 minutes and than decided the paper towels looked like more fun. I let Layla pick the colors, so we ended up with a little bit of everything mixed in there, but if you’re decorating a room with this piece stick to a specific palette. Once the paint is totally dried, peel that tape back to reveal your name or image. Did you enjoy our “Tape Pull Painting” activity? Please leave us a comment below and let us know! ← Flower Activity Round Up for the Spring time! I’ve seen this before! I’ve been wanting to do it with my son, but just never got around to it! Going to bookmark it as a project we can do this summer together!